With the role of technology in the modern business environment constantly evolving, managing your IT has become a full-time job. That’s why it is so important to have an IT service provider who can manage your technology investment properly. Total Computing Solutions specializes in leveraging technology to help small to medium sized businesses grow in the Northeast Wisconsin area. 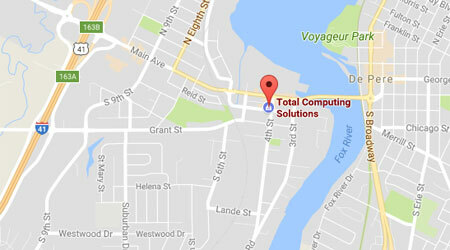 To find out more about the great things Total Computing Solutions is doing for clients in the Green Bay area, reach out to us at (920) 569-2681 or send us an e-mail at service@tcsdepere.com to start a discussion with a member of our team about what we can do for your company. Business Continuity Solutions: Total Computing Solutions ensures full recovery of all your information in the event of disasters such as floods or earthquakes. We partner with DataGuard Hosting to provide you with a comprehensive business continuity plan including local and online backup as well as workstation and server virtualization. Cloud Services Management: We’ll help your business safely make use of cloud technology in a way that enhances your overall IT infrastructure. Through our partnership with DataGuard Hosting, we offer website and e-mail hosting. We can also set-up private cloud systems as per your business’ needs. VoIP: Let us upgrade the way your company communicates with voice over internet protocol communication technology. Say goodbye to expensive phone bills and unreliable landlines with Total Computing Solutions VoIP solutions. Personal Managed Services: Total Computing Solutions takes pride in the personal relationships we build with our clients. We take the time to learn as much as we can about your company so we can provide you with the tools you need. Improved Security: We partner with Avast! to provide you with enterprise-grade security software including anti-virus and application layer firewall software. We also work with full-disk encryption software to help protect the confidential data stored on your workstations and servers. Network Design & Management: We will upgrade and maintain your network so that it runs faster and better than ever before. This is just one of the ways we help you get the highest return on your technology investment. Get the competitive edge in your industry with the best IT service provider. Give us a call at (920) 569-2681 or send us an e-mail at service@tcsdepere.com to learn more about what Total Computing Solutions can do for you and your business today.